Episcopal worship took place in Belleville as early as 1860 and, although there was no rector, the first baptisms and confirmations occurred in 1865. Regular worship began when 18 dedicated persons met February 5, 1880, at the Academy of Music Hall, now known as Philharmonic Hall.With a list of prospective members and $300 pledged in support, the group applied to the Diocese of Springfield to become a Protestant Episcopal church to be called St. Luke’s Mission. The name of the mission was later changed to St. George’s, probably to avoid confusion with a new Roman Catholic Church also called St. Luke’s. Services took place in rented rooms, but before long the group had purchased the land on which the present buildings stand and, at ceremonies October 29, 1882, the congregation laid the cornerstone for St. George’s Episcopal Church. The new Gothic structure, finished in spring 1883, had rolled stained glass windows made in St. Louis and pews of ash and cherry, all costing $5,000. For much of the early part of the first century, St. George’s suffered periods of low attendance and low finances, with a succession of priests and at times only lay readers to conduct the services. But in 1898, the church was debt free due in large part to a very active Women’s Group. In 1900, the bishop consecrated the church, and from that point on St. George’s grew in numbers, renewed in community spirit. In 1902, the members gave approval for building a rectory on the land adjacent to the church. In 1928 the congregation voted to incorporate as a parish rather than a mission. It was also during this time that St. George’s established an outreach effort with Scott Field. Today, parishioners from Scott Air Force Base are an important part of the life of St. George’s. In January 1938, with 32 pledges in the form of $100 organ bonds, individuals, families and parish organizations provided funds for an eight-rank pipe organ purchased from Wicks Company of Highland, Illinois. Bourdon bells were added 16 years later. The church continued to grow and change during the 1940s and 50s through the dedicated efforts of many individuals and organizations. One unique memorial given during this time came from the women of the church. Many donated their beautiful gemstones and gold to be sent to England where artisans created a gold chalice. This ornate, jewel-encrusted chalice is used today for all special services. After many years of repairs and renovations to the old parish hall, in 1964 ground-breaking services celebrated the beginning of a new parish hall. It was completed in 1965. Also during this time, a full-scale renovation project began on the church interior, including moving the altar, organ and reredos. The inside and outside of St. George’s was completely repaired and beautifully renewed with new pews and carpeting, new paint and much more space by 1967. In 1971, after much discussion, the vestry agreed to raze the old rectory next to the church. This property would become very important in the future. In 1982, St. Mark’s Lutheran Church was looking for a place to worship, and they were welcomed at St. George’s with open arms. The Lutherans have become an active and important part of our parish life and have given much in return, including the High Street parking lot as their contribution to the 1991 redevelopment of the facilities. The two parishes work together in many areas, including operating one of the busiest food pantries in St. Clair County. Also in 1982, Virginia and Charles Todd gave St. George’s their estate near Columbia, Illinois, for a retreat and conference center that would reach out across denominational lines. Toddhall has become one of the most prominent and important retreat centers in the United States. The center greets guests from all parts of the country and the world and is staffed by volunteers from the church as well as full-time center employees. The Toddhall Board of Trustees, which consists of appointed parishioners and other interested persons, manages the center. In 1987, our Bishop asked St. George’s if we would be willing to support the founding of a new mission in O’Fallon, Illinois. Not only did the church support the new mission financially, but most important of all, it supplied a group of dedicated, faithful people to serve as the foundation for this mission, soon to be called St. Michael’s. This beautiful mission church is today well on its way to becoming a self-supporting congregation of the diocese. 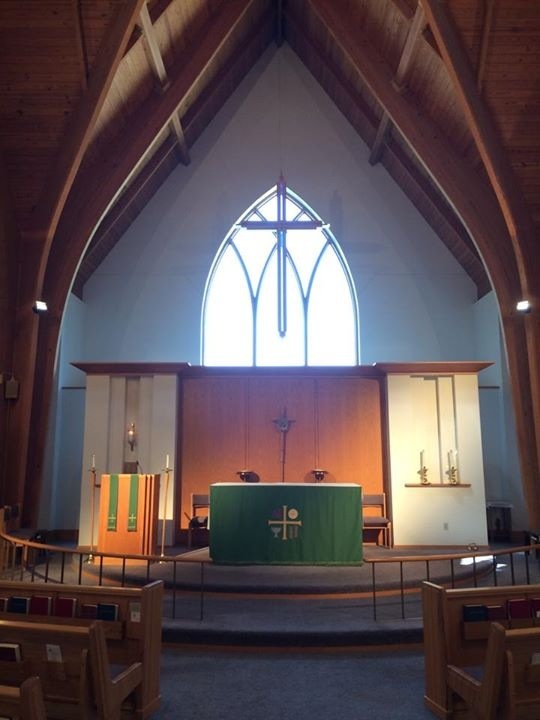 In March 2000, St. Michael’s Episcopal Church moved into it’s own church on Troy-O’Fallon Road in O’Fallon and is working toward becoming a full parish. Also beginning in 1987, St. George’s Vestry and various committees began to take inventory of the physical needs of the church building in which we worshipped. They soon discovered the many limitations that had long existed, but to which we had become accustomed – a vesting room for the choir that could barely accommodate 10, much less 25 persons; a parish hall too small to hold half of the people who might attend church; a Christian education program forced to hold classes in a garage outside the parish hall; an acute scarcity of closet space; and last but not least, the realization that if we wished to bring people to Christ, and in particular to St. George’s, we needed to have room for them. At a historic meeting Sunday, October 8, 1989, the parish voted overwhelmingly to proceed with plans to renovate the existing space at St. George’s, to build a new church building and parish hall adjacent to the existing church, and to embark on a capital campaign to raise the necessary funds. A highly successful capital funds drive raised a more-than-expected $800,000 and, with the architectural firm of Mackey-Mitchell of St. Louis and the Holland Hinrichs construction firm, St. George’s broke ground June 30, 1991. A beautiful 3,800-square-foot church seating 325 people was consecrated December 8 that same year. Also completed in the next few years was the renovation of the existing parish hall to be used for classrooms, nurseries, office space, the food pantry and storage. The parish also renovated the original church as a chapel, including space for a choir rehearsal area and music offices. By the grace of God and the generosity of His people here, this parish has been richly blessed. We have grown, recouping the numbers we sent out to help found St. Michael’s mission congregation and adding to them. St. Michael’s also has grown, and the two congregations together, serving the area that St. George’s alone had served, have grown by 50 percent. St. George’s has been blessed with many wonderful gifts given to the church over the years. Sometimes it is simply a gift of mowing the lawn during the hot Midwest summer or volunteering at Toddhall. Another living example of these blessings is a magnificent new 32-rank pipe organ given by Mrs. Audrey Marsh King in loving memory of her parents, which fills our church space with its glorious music. This gift took two years to construct and install but that first Easter in 1998 was joyously celebrated with beautiful music. In 2000, another miracle came to pass at St. George’s: we were able to pay off the mortgage on the new church. The effort and dedication of the congregation and the many gifts and wonders of God’s love enabled us to have a marvelous party in June to burn the papers! In June 2000, St. George’s long-time rector the Rev. Elliot H. Blackburn retired, and the parish undertook the self-examination that begins a search for a new rector. Duffy Walters was named chair of the Search Committee, which included a broad representation of parish constituencies. The vestry called the Rev. Jim Leovy, a trained interim, to serve during the search process. Fr. Leovy guided the search committee and the vestry deftly through the interim. It was a challenging time, as the parish faced tragic and untimely losses in its membership and the horrific events of 9/11. Fr. Leovy brought extraordinary pastoral gifts to St. George’s and made significant contributions as we struggled to understand these losses. He also provided effective support to the parish’s lay ministries. On the unanimous recommendation of the Search Committee, the vestry voted, also unanimously, to call the Rev. Christopher V. Coats to be our next rector. Fr. Coats arrived in February 2002, bringing boundless enthusiasm and energy to the parish and a profound commitment to sharing the Good News beyond the parish walls. Within a year Fr. Coats, a chaplain in the Army Reserves, was called up and deployed to Iraq. In his absence, Assistant Rector the Rev. Emily Schnabl became acting rector, providing liturgical leadership and compassionate pastoral care throughout Fr. Coats’s deployment. He returned to the parish in April 2004. The good work that he had begun resumed with his return. Outreach ministries burgeoned, and St. George’s parishioners have added neighborhood renewal, a daily lunch program for the elderly, partnership in the St. Mark Lutheran Church Crisis Fund, increased involvement in the Franklin-Jefferson Neighborhood Association and expanded financial support for numerous social service organizations to their existing outreach ministries. In September 2005, the parish welcomed an evacuee family from Mississippi, victims of Hurricane Katrina, to its Toddhall Retreat and Conference Center in Columbia. Numerous parishioners are involved in addressing this family’s various pressing needs. The Spiritual Growth Commission sponsored the parish’s first Lenten retreat in 25 years in February 2005, with a mandate to continue offering annual retreats. The commission also hosted a weeknight program on tools for spiritual growth during Lent, and is exploring other opportunities for spiritual renewal to offer the parish. The music program has thrived under the leadership of Music Director Nancy Ypma, D. Mus., and in March 2005 the adult choir traveled to Washington to represent Illinois at the National Cathedral’s Illinois Day, The choir presented a 25-minute choral prelude before the Cathedral’s principal celebration of Holy Eucharist, a singular honor. The Rev. Deacon Suzanne Wolfenbarger, who was raised up at St. George’s and confirmed to the diaconate in 2000, joined St. George’s clergy staff in the fall of 2004, assigned by Bishop Peter H. Beckwith. We see St. George’s as an ever-growing fountain of God’s living water, welling up through programs of spiritual growth and campus expansion, enabling us to meet immediate needs; to nourish, refresh and educate a growing congregation; to reach out to young and old; and to serve the community. In September 2006 Deacon Suzanne Wolfenbarger left St. George’s to pursue her seminary studies and complete her quest for the priesthood. She became the first woman from our parish ordained to the priesthood 2011. Also in September, the Rev. Chris Coats accepted a call to Holy Spirit Episcopal Church in Gulf Shores Alabama. The Rev. Emory Washington came to supply until we called our interim rector, and stayed nearly 9 months. We are most grateful for Fr. Washington interrupting his retirement to help us through this time. In 2007 we welcomed Rev. Dale Coleman first as an interim rector and then he accepted a call as our rector in 2008. Soon his wife Rev. M. Joan (Jody) Coleman joined our ministry team as a deacon in 2010. With our clergy settled in we are now in a period of growth and renewal. In 2012, we celebrated our 30th anniversary of our relationship with St. Mark Lutheran with a banquet and a series of activities together. We are looking forward to continuing our relationship for many years to come. 2003-2004 Rev. Emily Schnabl (Acting Rector) while Rev. Coats was deployed to Iraq.